Sometimes we need to open multiple views of things, such as several images when editing, copying and pasting between them, or two or more documents when working on a report. 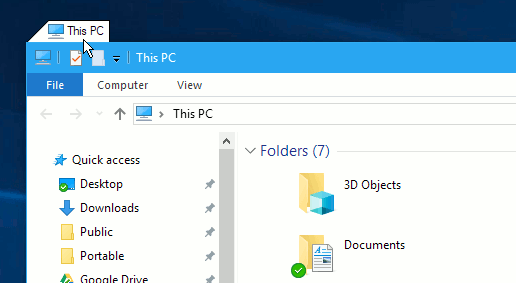 We may want two or more Explorer views so we can access the contents of different disks or folders without having to go back and forth. The desktop can be filled with separate windows and there is nothing to stop you opening five Explorer windows if that is what you need, but the screen then becomes messy and cluttered. It can be hard to find the window you want because it may be buried underneath other windows. The problem is most irritating when using a laptop with a small screen and there simply isn’t sufficient desktop space to have lots of windows open without them overlapping each other. 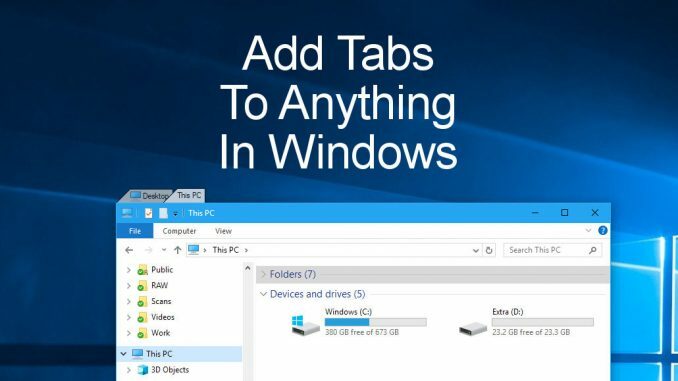 Adding tabs to windows on the PC’s desktop is the solution. Just as with web browser tabs, you can open multiple tabs for Explorer, a photo editor, word processor, and many other applications. This means that windows do not fill the desktop and it is easy to switch from one tab to another with a click of the mouse. Removing the desktop clutter might enable you to work more efficiently, especially on a small screen. How do you add tabs to windows? TidyTabs is a utility that adds tabs to windows and is the feature you have always wanted. It is free for personal use, but must be paid for if you want to use it for work. 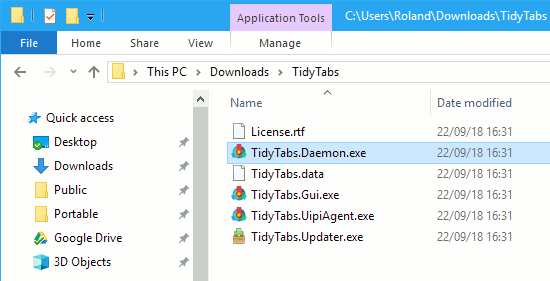 There is a regular version that comes with an installer and a portable version of TidyTabs that does not need installing and can be removed simply by deleting the folder. TidyTabs cannot be seen when it is running, so you might wonder where it is. There is an icon at the right side of the taskbar and right clicking it displays a menu. 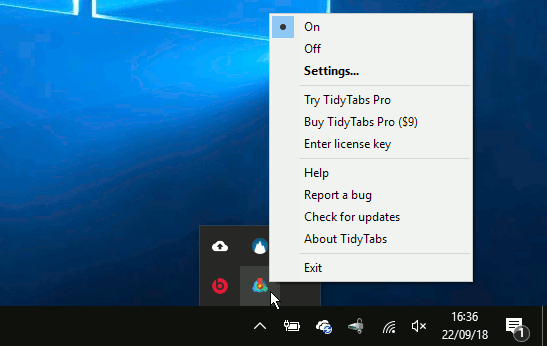 This is not needed very often, but it is useful to know how to turn TidyTabs on or off, or access the settings where it can be set to auto-load with Windows if you want it to. Ignore that taskbar icon and open a program window. 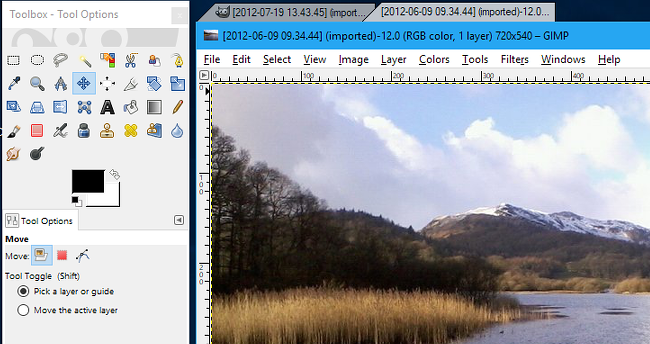 Explorer will be used in the example, but it works with many programs. Probably not all programs, but certainly a lot of them. Move the mouse to the top left corner of the window and a tab that was previously hidden is revealed. So how do you open more tabs? Open another Explorer window. 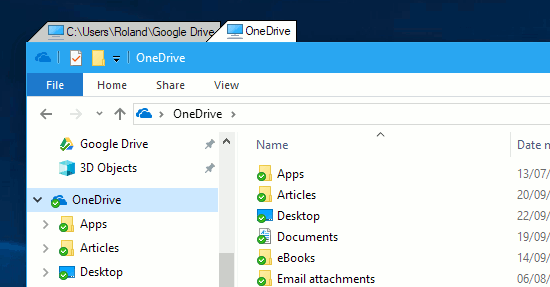 This can be done by right clicking a drive or folder and selecting Open in new window on the menu that is displayed. A quick way to open a new Explorer window is to Shift+click the Explorer icon in the taskbar. Other programs may require you to go to File > Open or use some other method to open a new window. With two windows open, move the mouse over one to show the tab at the top, then click and drag it to the other window and drop it next to the tab. As can be seen above, there is now only one Explorer window but it has two tabs showing two different views of the disk. Click a tab to view each window. TidyTabs is not just for Explorer and it works with other software. A harder test perhaps is GIMP. Multiple photos can be opened in multiple windows of course, but to save having several images open on the desktop or minimising windows to the taskbar and opening them again, they can be opened in tabs. Just open two or more images and then drag one window by its tab and drop it next to the other window’s tab. Is this an easier way of working? Some people may prefer tabs to having lots of windows on the desktop or minimising and maximising them. Of course, sometimes it is useful to have two windows open side by side, so you will not need TidyTabs all the time. Use it when you need it, but use multiple windows when that is better.